A little ditty read out at Bill Panting’s funeral. I am sure some of you will relate to the ditty. There once was a time in HM Ships , when the magic hour had come. The Leading Hands of every mess prepared to collect the rum. 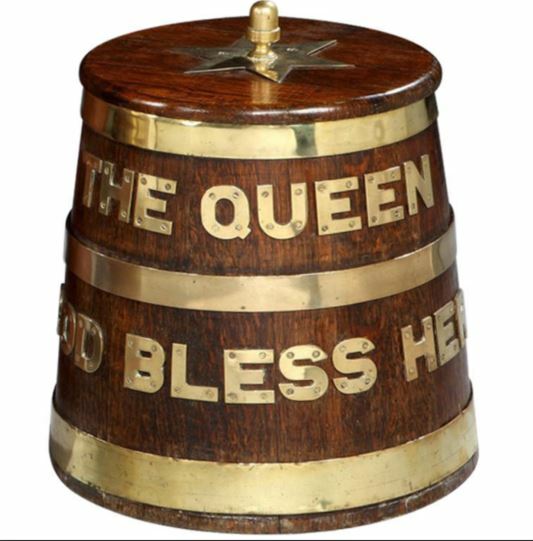 A daily tot of Nelson’s blood was a favourite of every man. When the Rum Bosun stood, his measure poised to serve every man his tot. Two fingers always in the ‘cup’, making sure that the ‘Queen’ got her lot. with a sipper given from each man’s tot his hand was no longer steady. The rum rat sat, his eyes aglow his whiskers twitching well. He liked his rum so much it seems he could get pissed on the smell. Sometimes the tots were passed around as each man paid his debts. Favour, rubber, game of crib could cost a couple of wets. Then came the time to sup the ‘Queen’ ‘God bless Her’ was the toast. A watchful eye, as each man supped so the Rum Bosun got the most. the dits began, as the ‘Grog’ took charge, of favourite runs ashore. A feed, a fight, a couple of pints was part of a run ashore. A game of darts was in there too, then all night in with a Pompey Lill. No longer though, does the scent of rum pervade her Majesty’s boats. old shipmates meet and share a wet spinning dits of the good times passed. A toast then to Horatio and another to the Queen. and may we all, wherever we are, remember where we’ve been! Amen to that! Up Spirits, Stand Fast the Holy Ghost.